I made this Woman's leather wallet purse from high quallity Italian leather for money and cards. • The wallet can fit all cell phones up to iPhone 6 size. • The inside contains a variety of compartments and pockets to help you keep an organized wallet. Esy to remove the card. 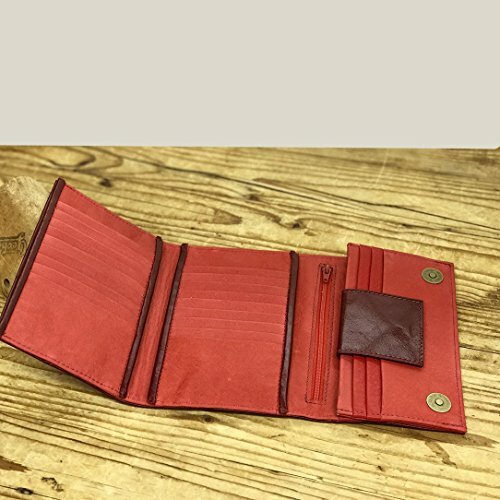 A beautiful veg ten leather stunning leather handmade wallet. very comfortable and divided according to the daily needs, and perfectly finished to the smallest details. This wallet is best for travelers, they can carry lots of cards, identity cards, currencies, tickets and passport all at the same place.Minimalist, strong, durable.I sew this wallet with love for fine workmanship and clean design. - A small Flap-over with a single snap closure for safety. SAMPLES OF A HAPPY CUSTOMER REVIEW: " Hi Limor! Oh my goodness! I LOVE my new wallet! Your wallet is gorgeous! I have been searching for the perfect wallet and yours is indeed just that - perfection! I can tell you "sewed" love into this product. :) Thank you too for taking the time to beautifully wrap my wallet! This was great as it was a gift from my Husband (who doesn't like to wrap gifts). We are both super pleased and I cannot wait to show my friends and family who will hopefully buy something from your shop! Many thanks and I hope you have a Happy New Year! Molly"
All items in the shop are handmade with love and attention in my studio in Israel. If you have any questions, please do not hesitate to contact me in Messages.